Gemara Buddy - the perfect way to learn and review Gemara – Ideal tool for beginners. With Gemara Buddy you don't only see the page of Gemara in its traditional format, you hear it explained in simple English. Just click anywhere on the daf and – presto – the lesson begins. Perek Eilu Metzios is taught by Rabbi Zakon of Jerusalem. Gemara Buddy - the perfect way to learn and review Gemara – Ideal tool for beginners. With Gemara Buddy you don't only see the page of Gemara in its traditional format, you hear it explained in simple English. Just click anywhere on the page and – presto – the lesson begins. 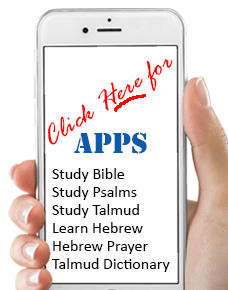 While listening to the daf you can click on any word – Hebrew or Aramaic -- and see an instant translation of that word with Gemara Buddy's exclusive Hebrew and Aramaic to English dictionary. Gemara Buddy also includes charts and help sheets for each page of the Perek as well as prepared printable quizes. Gemara Buddy has everythhing you need to succeed in learning Gemara. Gemara Buddy is more than just a beginners class on Gemara. With its abundant tools its an educational tool which nothing else compares. Translate any word, look up any cross reference, make the page larger or smaller; view or print out a crisp, clear copy on your printer; color code the daf any way you like; add Nikud (vowels) to the text, and add sentence punctuation such as question marks, hyphens, periods even exclamation marks to help you learn the proper reading of the Gemara. You can also select any part of the daf and paste it to your paint program to make up worksheets; type or tape record your own notes … and more. Explains and Narrates WORD by WORD in concise English. Search Engine, Copy and Paste, Fonts and Sizes, Exportable. Torah Ohr: Full Tanach Hyperlinked to the Daf. English Translation of the whole Tanach. Rashis Hebrew commentary on Tanach. Ein Mishpat: Full Rambam and Shulchan Aruch Hyperlinked to the Daf. Mesoras Hashas: Full Talmud Hyperlinked to the Daf. Go to Daf or Perek. Built-in Hebrew or English Note Taker. The festival of Shavuot has no complicated rituals like those of Passover or Succot, but ­ as the holiday marking the giving of the Torah at Sinai ­ it encourages Jews to stay up the whole night and study. But what do you do if you want to study Talmud in honor of Shavuot, for example, and you don¹t know how? There are apparently enough Jews out there with such a desire, and they are the potential audience for Gemara Buddy, a program for learning and reviewing Gemara, even for complete beginners. Produced by TES of Monsey, New York with support from the Jewish Continuity Foundation, it stars Rabbi Nachman Zakon, principal of Yeshiva Ohr Olam high school in Jerusalem¹s Har Nof quarter who has written Jewish-themed books for children in the past and has a talent for explaining complex ideas in simple English. While listening to the explanation, you can click on any word ­ Hebrew or Aramaic -- and see an instant translation of that word with Gemara BuddyOs Hebrew-and Aramaic-to-English dictionary. It¹s also easy to look up a cross reference in the Bible, the Shulhan Aruch, the Mishna Brura or Maimonides¹s commentary, as an icon appears on the left hand of the page: Just click a button and the relevant passage appears. The Talmud Text is shown in the format of pages from the Babylonian Talmud, with Rashi¹s commentary and the Tosfot flanking the verses on either side. The oral lessons in English covers the entire talmudic page (front and back) in about one hour, and there are 12 such lessons. Rabbi Zakon¹s narrated explanation is extensive and comprehensive. With the Start/Play/Stop/Rewind/Pause icons, you can begin and stop listening when you wish. And one doesn¹t have to listen to the whole narration at once. You can key in the verse and go straight to the part you want to hear. The text can be viewed in small, medium and large type in the traditional format, but you can also turn it all into regular word-processed text in any font and size using its tool menu. Users can even add vowels automatically to the text plus punctuation such as question marks, hyphens, periods and exclamation marks to help them learn to read the text more easily. Teachers will find it useful to copy and paste text to their computer¹s paint program to make up worksheets and create written annotations (which can be sent as e-mail messages) or record their own notes in their own voices with the built-in sound recorder. The on-screen highlighting and printing capabilities allow users to color code and highlight each page in as many different colors as they wish. They can view the text with their customized highlights and print them out on a color printer. The camera icon on the bottom of the screen is useful for adding pictures, charts and diagrams, and you can add artwork from your own digital archives as well. The program also includes charts, diagrams and help sheets for each page of the chapter as well as prepared fill-in quizes that can be printed out (the answers cannot, however, be typed into the empty line and checked by the program). A Daf Yomi calendar that informs you what part of the Gemara should be studied on the day assigned to it is also available by clicking an icon on the right-hand side of the screen. So while making your cheesecake for the holiday, prepare your Talmud study in advance by printing out text, as Jewish law does not permit using a computer on Shavuot.